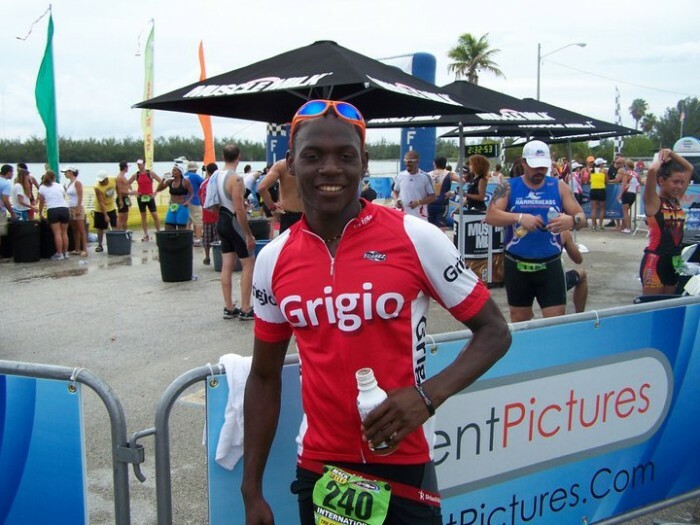 The name Sharif Kakooza might not mean much to triathlon fans yet, but the 18-year old has a story worth telling. He started swimming, age 9, in a water hole near his home in Uganda. He then found a pool, where he cleaned the bathrooms, ran errands and helped with filtering, to pay his way to swim. From there, he started training with a team that used the pool, set national junior records and secured a berth on the Ugandan team for the prestigious FINA Swimming World Championships in 2009. In Rome at those championships, he met one of his heroes, American Olympic medallist Dara Torres, who asked him about his future and suggested pursuing a scholarship overseas. Kakooza replied that while he loved swimming, he’d become obsessed with another sport: triathlon. Kakooza had competed in the local Lake Victoria triathlon in 2008 and 2009, after an American family he was then staying with said he should give it a go. Even though the water hazards in the lake included hippos, and despite getting lost on the bike course the first year, he was hooked. July 3, 2011 Maputo ATU African Championships in Mozambique. September 3 to 18, 10th All Africa Games Maputo 2011. Triathlon makes its All Africa Games debut. A few months after returning from Rome a package from Torres arrived, including a triathlon magazine that mentioned an event in Miami. Kakooza emailed the race organiser, who offered him a free spot, a homestay and even a bike to race with. He’s been in Florida since 2010, competing in age-group races and going to school. Soon he’ll have the support of the ITU’s development programme and according the Director of ITU Development, Libby Burrell, Kakooza is hopefully just the start of a new wave of triathletes out of Africa. But there is evidence to suggest that this year could be a defining one for triathlon in Africa. 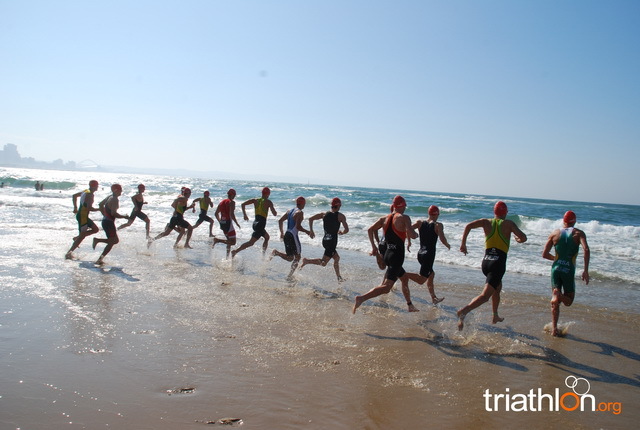 It all starts this weekend, at the 2011 Maputo ATU Triathlon African Championships in Mozambique, there will be athletes across the elite, under23 and junior men’s and women’s, from nations like South Africa, Mauritius, Kenya, Morocco, Namibia, Zimbabwe and Egypt. Some are already stars on the ITU circuit, like 4-time African champion and Olympian Kate Roberts (RSA), who became the first athlete from Africa to gain entry into the ITU Gold Group this year. Her South African teammate Hendrik De Villiers became the first African triathlete to ever win an ITU World Cup in 2007, at home in South Africa. Namibia’s Abrahm Louw finished fifth in the inaugural 2010 Singapore Youth Olympic Games men’s triathlon and will compete in next week’s Edmonton ITU World Cup, along with Christopher Felgate (ZIM) as part of Team ITU. Others to watch are Richard Murray (RSA), Wikus Weber (RSA), Matthieu Mamet (MRI) and basically, any athlete from Egypt. “I think there is a huge amount of talent in Egypt, they could be the powerhouse of triathlon,” Burrell says. In the future, she identifies Botswana as another potentially strong area. This year though, the African titles are the prelude to something bigger - as the test event for the 10th All Africa Games Maputo in September. The event is Africa’s biggest when it comes to sport and triathlon is making its debut in 2011. Burrell believes this is where the next stage of development should be centered. And she is an expert, as a South African - most of her coaching career has been based in Africa. “At this stage I think if in the next four years if there isn’t a major event then yes it will affect triathlon. But I think what we need is to make sure we have a continental cup in the four corners of Africa, or three thirds of Africa and put enough emphasis on that. I think that is really important,” Burrell said. The All Africa Games is a major multi-sport event held every four years. It is officially recognised by the International Olympic Committee as a major continental multi-sport event. The first Games were in 1965 in Brazzaville, Congo and Egypt has the most medals in games history, ahead of Nigeria and South Africa. The 2011 edition includes 20 different sports, with triathlon making its debut. Roberts, who is aiming for her fifth African championship this weekend, believes that developing athletes locally is key, and a little self-belief. Burrell hopes that more athletes in Africa can dream big, and possibly achieve it, like Kakooza. While Kakooza will not race in Maputo this weekend, he will be racing at the All Africa Games.